The Massachusetts Legislature has rightly drawn criticism for getting little accomplished in the past year, and the following is yet another example of that apparent failure to go ahead and just do the right thing. The right thing would be to enact H. 1459, a bill that would make it easier for parents of individuals with developmental disabilities to become their guardians. It’s not among the more visible pieces of legislation that lawmakers have had to deal with; yet, it’s potentially important to all family members of developmentally disabled people, and we’ve heard of no reason why it should be controversial. The bill, which was last filed more than a year ago with the Judiciary Committee, proposes that a spouse or parent be presumed in probate court to be suitable as a guardian of a developmentally disabled or otherwise incapacitated person unless competent evidence is introduced to the contrary. 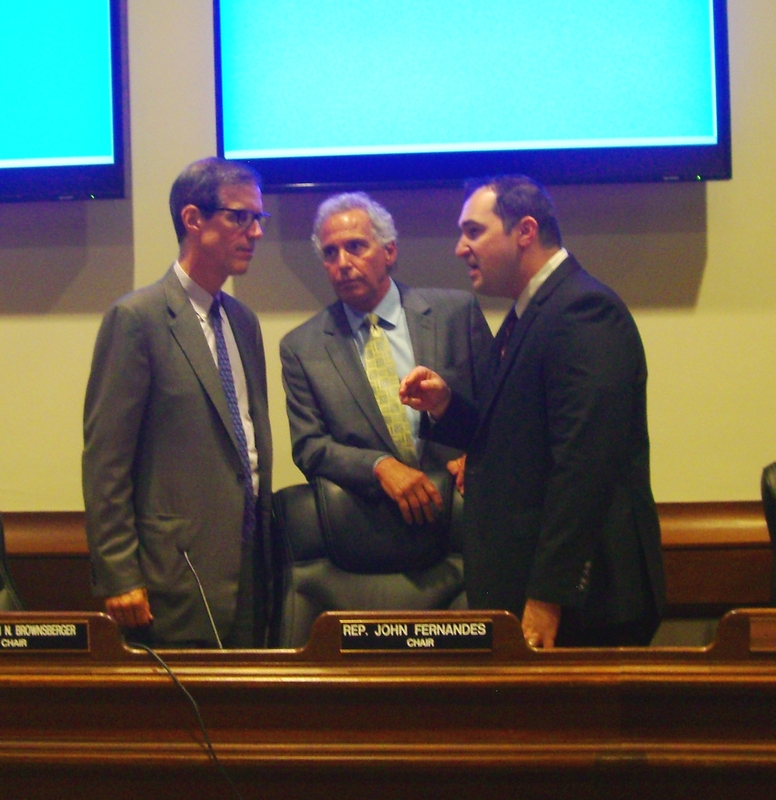 State Sen. William Brownsberger (left) and Rep. John Fernandes (center), co-chairs of the Judiciary Committee, confer during a committee hearing last June on H. 1459 and related bills. The committee has subsequently taken no action on H. 1459. The bill has the support of major advocacy organizations for the developmentally disabled, including COFAR, and even of the Massachusetts Developmental Disabilities Council, which, while federally funded, is yet technically part of the Baker administration. The MDDC listed H. 1459 as one of its legislative priorities for 2015-2016. Yet while the Judiciary Committee did hold a public hearing on H. 1459 last June, at which COFAR and other organizations testified in support of the measure, the committee has taken no action on the bill. State Representative David Linsky has actually repeatedly filed the bill since 1999 at the request of Stan McDonald, a constituent of his, who has been involved in a seemingly endless and infinitely frustrating battle to gain guardianship of his son, Andy. The bill, however, never gained any traction in the Legislature from 1999 on. This past year appeared to be different, particularly given that the bill was labeled a priority by the MDDC. But now it’s not clear that anything really is different than in those past years. Earlier this month, both Linsky and Senator Richard Ross, McDonald’s state senator, sent a letter to the co-chairs of the Judiciary Committee, Senator William Brownsberger and Representative John Fernandes, urging their committee to approve the bill and send it to the full House for a vote. I spoke last week to aides to both Ross and Linsky who said they didn’t know of any reason that the bill has not moved in the committee. An aide to Linsky said Linsky had met “more than once” with Fernandes to urge his support for the bill. I then spoke last week with the legislative counsel to Senator Brownsberger, who said she too knew of no reason that the bill has not yet come up for a vote in the committee. She said I should talk with Fernandes’ office because the measure is technically a House bill. So I called Fernandes’ office on Friday and was forwarded to a legislative aide’s voice mail. So far, no one has called me back. To be fair, the Judiciary Committee has also taken no action on a related bill (H. 1469), which would prohibit state or other authorities from charging a parent or legal guardian with abuse or neglect, based on the type of medical care the parent or guardian has chosen for an individual in their care. That bill, dubbed “Justina’s Law,” was also filed more than a year ago on behalf of the family of Justina Pelletier. Justina, a teenager, spent nearly a year in a locked ward in Boston Children’s Hospital after doctors there disagreed with the family’s belief that she was suffering from mitochondrial disease. The outcome so far for these two bills shows how difficult it is to get even uncomplicated and uncontroversial legislation passed by the Massachusetts Legislature, and how much power the chairs of these committees have to stall or block legislation. Holding a bill for a year in a committee without taking action on it might not seem that long a time, but for the guardianship bill, there has been no action since 1999. Seventeen years is a long time to wait for a man like Stan McDonald, who is now 80 years old, to right the wrongs that have been done to his son and himself. It’s not that there has ever been any publicly stated opposition to the guardianship bill. As far as we know, no committee has ever actually voted not to approve it. It’s just that no one in power in the Legislature has apparently ever cared enough to do the right thing and enact the bill. This, in our view, is what is really wrong with the Legislature. It’s not that the leadership specifically won’t pass “progressive” bills; it’s that the leadership can and does block anything that it doesn’t like for whatever reason. And often we never find out what that reason is. While the Baker administration appears to be moving ahead with a policy of closing all remaining sheltered workshops for developmentally disabled persons in Massachusetts, records show that relatively few people so far have been transferred from the workshops to the “integrated employment settings” that are supposed to replace them. Confirming our concerns, the data from the Department of Developmental Services show that most of those people have been transferred to community-based day programs funded by DDS or MassHealth. This has financially benefited corporate DDS providers that run the day programs and that have been among the most vocal proponents of shutting down the sheltered workshops. In what we consider to be an example of the inappropriate influence of private interests in DDS policy, two of those provider organizations actually helped draft a key DDS document that called for the workshop closures. According to DDS records, the number of participants in sheltered workshops dropped by 1,166 between August 2014 and August 2015 — a 61 percent reduction from the 1,913 people who had been in those programs. The number of sheltered workshop providers dropped from 39 to 14. In that same period, the number of developmentally disabled persons in corporate-run, community-based day programs increased by 1,116, or 27 percent. In contrast to the increase in day program use, the number of developmentally disabled people in “integrated employment” settings increased from August 2014 to 2015 by only 337, or about 6 percent. DDS said it had no records on the number of integrated workplaces that exist in Massachusetts. Community-based day programs actually cost considerably more to run than do sheltered workshops, according to an expert in the field. A DDS document in November 2013, titled “Blueprint for Success,” stated that it was the department’s goal to close sheltered workshops to new participants as of January 2014 and to close all remaining workshops as of June 30, 2015. The closure of all of the workshops has not yet occurred, but it appears to be likely to happen despite protective language placed in the state budget for the workshops. The Blueprint called for a total of $26.7 million in state funding over a four-year period for the transition from sheltered workshops to mainstream work settings. But the document did not offer specifics as to how those mainstream jobs would be found. A 2014 Blueprint Progress Report, drafted by DDS and the ADDP, stated that $3 million allotted in the Fiscal Year 2015 budget for the transition from the sheltered workshops fell short of $5.5 million that DDS and the corporate providers had requested. Nevertheless, the report stated that 31 of 39 provider agencies would receive funding to transfer participants out of the workshops. It now appears most of the funding has gone toward community-based day programs. The expert we talked to suggested that it would have been more effective had the funding been earmarked for subsidies for employers for hiring developmentally disabled workers. Sheltered workshops provide developmentally disabled persons with a range of assembly jobs and other types of work, usually for a small wage. But the programs have become targets of a political ideology that holds that any type of congregate care setting is institutional in nature and therefore bad for those involved. Sheltered workshops allegedly “segregate” developmentally disabled people from their peers in the wider community or in the mainstream workforce. Many families of the sheltered workshop participants have countered that those programs are fully integrated into the surrounding communities and provide the participants with meaningful activities and valuable skills. Those families have also raised concerns that there are relatively few integrated or mainstream workforce jobs available for people with developmental disabilities; and that absent a sufficient number of such jobs, former sheltered workshop participants are likely to be transferred permanently to community-based day programs that do not offer the same activities or skills as the workshops did. The contrast between the percentages of people who have been transferred to day programs and those placed in integrated employment is not alluded to in a September 2015 progress report submitted by DDS to the Legislature’s House and Senate Ways and Means Committees and to the Children, Families, and Persons with Disabilities Committee. The data noted above on the numbers of people in sheltered workshops and other programs in 2014 and 2015 can be found in tables in the report; but there was no analysis in the report of the data and no conclusions drawn based on that data. But Howe did not explain in the report how or when that access to integration in the community would be achieved by DDS. Howe’s report also provided no data or information on the types of services offered in community by day program providers or how successful those programs might have been. The DDS’s 2010 policy directive similarly did not contain a plan for placing former sheltered workshop participants in mainstream jobs; but the policy directive did take a strong ideological stance against the workshops, going as far as to state that mainstream employment had been shown to be “a viable option… even for those individuals with the most significant level of disability…” No evidence or source was cited for that statement. The disappearance of sheltered workshops appears to be yet another example of the erosion of cost-effective care for the developmentally disabled due to the influence of corporate interests that stand to benefit financially from it. At the very least, this case shows that a public agency should not develop policies jointly with the corporate contractors that it funds. In what may be one of the first tests of the Pacheco Law in the privatization of human services, the Baker administration is seeking to contract out existing emergency mental health services in southeastern Massachusetts. What concerns us about this situation is that the administration is reportedly interpreting the Pacheco Law to allow a for-profit company, the Massachusetts Behavioral Health Partnership (MBHP), to cut its proposed wage rates within roughly a year after starting to provide those services and potentially to pocket the extra profits. The administration’s interpretation of the Pacheco Law has drawn a rebuke from the law’s author, state Senator Marc Pacheco. If the state auditor concurs that the outside bidder’s proposed contract is less expensive and equal or better in quality than what existing employees have proposed, the privatization plan will be likely to be approved. If not, the auditor is likely to rule that the service must stay in-house. Under the law, an outside contractor’s proposed bid must specify wages at the lesser of either the average private-sector wage for the equivalent position or the lowest public-sector wage level for the position. In other words, the law establishes a minimum wage rate that the outside contractor must propose. The Pacheco Law does not apply when contracts for privatized services are renewed. In other words, if a private bidder wins a contract under the Pacheco Law process, that contractor does not have to undergo another review by the auditor in order to renew the contract. The reason that Provision 2 above is pertinent to this case is that MBHP currently has an ongoing Primary Care Clinician (PCC) contract with MassHealth for separate clinician services that is scheduled to run through June 30, 2017. As we understand it, the administration intends that the current PCC clinician services contract with MBHP will become the overall contract for the emergency services that the administration is now seeking to privatize. And the administration’s interpretation of Provision 2 above is that if the privatization plan is approved by the auditor, all of the contract provisions in the contract bid will cease to exist when the current PCC contract is renewed. Thus, it is reportedly the administration’s position that after the MBHP’s PCC contract with MassHealth officially ends in June 2017, MBHP will be legally free to cut the wage levels it is stipulating in its bid. If so, we believe it is unlikely that the company would pass along the savings in cutting wages to state taxpayers, but would instead pocket those savings as profit. As a for-profit, MBHP has an incentive to pocket any operating cost savings as retained earnings. The administration’s interpretation of the Pacheco Law is ironic because one of the main objections to the law from the law’s most vocal opponent, the Pioneer Institute, is that the bidding contractor in a privatization proposal is required to stick to the terms of its bid whereas there is nothing in the law to ensure that the terms of a state employee bid are enforced. The Pacheco Law does not contain any requirement that agency employees subsequently provide service in the most cost efficient manner or in an improved manner if the proposed privatization contract is rejected. But in fact, it appears that it is the administration’s interpretation that it is the outside contractor that doesn’t have to stand by its bid once its contract is renewed. Although renewal contracts for validly privatized work do not need to be resubmitted to the Auditor (for a Pacheco Law review), it was never my or the other supporters’ intent that wages and health benefits could sink lower than the “minimum wage” established by the Taxpayer Protection Act (the Pacheco Law) once the initial contract expired. If that is permitted, the statutory purposes of preserving the quality of publicly funded services and providing minimum protections for private sector and public workers would be completely undermined. Moreover, it seems to us that the Pacheco Law does prevent the state employees from submitting an artificially low bid and then subsequently ignoring it. The Pacheco Law states that if the employees want to submit a bid with wage costs that are lower than what are in a collective bargaining agreement, they must negotiate a change in that agreement with the applicable state agency. That new collective bargaining agreement is binding on the state employees and cannot be changed unless the state agency agrees. As we understand it, the Baker administration is projecting a savings of $5 million a year in privatizing the emergency mental health services in Southeastern Massachusetts. SEIU Local 509, a state employee union, has put in a bid on behalf of the state employees currently providing the emergency services that envisions saving about $500,000 per year. So, the state auditor may well determine that there would be a greater savings in privatizing the services. However, the union is arguing that the quality of those services is likely to decline under the privatization plan because the financial savings will depend on major cuts in staffing. The administration’s reported interpretation of the Pacheco Law’s contract renewal provision appears to bear out the SEIU’s concerns about a potential drop in the quality of the privatized services offered by MBHP. If MBHP or its subcontracting firms are legally free as of mid-2017 to cut the wage rates proposed in MBHP’s bid for the emergency services, it seems to us to be very likely that the quality of those services will suffer. It’s hard to overstate how politically connected MBHP is. There appear to be a number of close relationships between the company and the Baker administration and with previous administrations — and in particular with the Executive Office of Health and Human Services, which will oversee the privatized mental health services. Last April, Scott Taberner, previously the chief financial officer at MBHP, was named Chief of Behavioral Health and Supportive Care in MassHealth, the division of EOHHS that administers Medicaid and healthcare for low income and disabled persons. Taberner’s position in Masshealth was created by the Baker administration. MassHealth is seeking the privatized mental health services contract with MBHP. Prior to that, in late May 2014, Beacon Health Strategies (Beacon) announced its plan to merge with ValueOptions, the parent company of MBHP. Under the arrangement, Beacon will be 50 percent owned by Bain Capital and 50 percent owned by Diamond Castle Holdings. Bain Capital was formed by former Massachusetts Governor Mitt Romney. Last April, the same month that Taberner joined the Baker administration, former Massachusetts Governor Deval Patrick joined Bain as a “social impact” investment advisor. That doesn’t appear to have any direct connection to the proposed MBHP privatization contract, but I thought I’d throw that in. According to the Mass. Psychological Assn. (MPA), ValueOptions and Beacon both hold a large market share in programs in Massachusetts that are paid for through public funds. As noted, MBHP manages benefits for the PCC program. The MPA estimated that once the merger was finalized, Beacon would manage the behavioral health benefits of 78 percent of the Massachusetts Group Insurance Commission members and of 70 percent of MassHealth members. It does appear that the merger went through. Now it appears that MBHP is being primed by the administration to run the privatized emergency mental health contract via MassHealth; and Taberner, a former MBHP executive, appears to be involved in that effort or is at least in a position to oversee it. …Taberner will lead reforms to better coordinate and integrate care for behavioral health, physical health and long-term services and supports for elders and persons with disabilities. The Baker administration wants to make the emergency mental health services part of the MassHealth PCC contract with MBHP. A former MBHP executive is now in a high-level position in the state agency contracting with his former company. And now the administration is interpreting the Pacheco Law in MBHP’s favor by indicating that if the privatization plan is approved, MBHP will be legally free to cut wage levels as of June 2017 when its PCC contract up for renewal. The Pacheco Law has borne the brunt of much bad press and political criticism over the years; but we have argued that most of that criticism has been based on misinformation about the intent of the law and what it actually does. The proposed privatization of the Southeastern Massachusetts emergency mental health services demonstrates why the auditor’s scrutiny is needed of such privatization proposals and consequently why the Pacheco Law provides critically important protections for taxpayers and the quality of public services.